Today the name "Bentley" is synonymous with both ultimate luxury and performance, however that was not always the case. Bentley which began as a small company producing aircraft engines during World War I, would after the war shift gears and produce some of the fastest cars during the 1920s. Bentley’s performance reputation had no rivals during this era with five 24 hours of Le Mans victories from 1924 to 1930. A trend that would have continued if it had not been for Rolls Royce purchasing Bentley in 1931. The purchase saved Bentley since the beginning of the Great Depression hit Bentley’s sales very hard. However with Rolls Royce now calling the shots, performance was thrown to the wolves and would not return for a very long time. Bentley’s new role was that of luxury car that was one luxury notch below the Rolls Royce – this would be the case for most of the 67 years Rolls Royce would be running the show (Rolls Royce sold Bentley to VW in 1998). By and large most of the Bentleys during these years were conservative. The 2-door 1952-1955 Bentley R Type Continental happened to be the exception – it was a low streamlined sporty luxury car that was certainly ahead of its time. Along with the Bentley R Type Continental there were other happenings during the 1950s at Rolls Royce – the most important was development of the L410 engine or more commonly known as the L Series V8 which was released in 1959. It was a pushrod V8 that would pave the future for both Rolls and Bentley. The L Series V8 has stood the test of time, much more so than even the most legendary American pushrod V8s that fueled the original muscle car era – all of which are no longer available in new production automobiles. Most bit-the-dust by the late 1970s when the EPA’s mandated Corporate Average Fuel Economy (CAFE) standards began their death grip. Even the original Chevrolet small-block V8 couldn’t escape this fate – its last year in a production vehicle was 2003 where it was found in Chevrolet and GMC’s truck lineup. It only lives on currently as GM crate motor in a few different iterations. The Rolls Royce L Series is not only alive in the current lineup of 2013 Bentley offerings but thriving. The L Series not only escaped death but it’s still available in new Bentleys and it officially became a Bentley only engine in 1998 when Bentley was sold to VW. The L Series has had since 1959 had a large bore of 4.10 inches and originally had a 3.60 inch stroke allowing it to displace 6.25 liters or 380 cubic inches. By the early 1970s, the stroke of the L Series was increased to 3.9 inches pushing displacement to 6.75 liters or 412 cubic inches. The L Series V8 only had one purpose during it’s first three decades and that was to provide an abundance of low end torque. Horsepower wasn’t part of the equation, Rolls Royce and Bentley during most model years wouldn’t advertise the L Series V8’s horsepower rating. And most Rolls Royce and Bentley buyers could have cared less about the omission. Where the Bentley had taken on the role of being 7/8s of a Rolls (a slightly scaled back Rolls). The 1980s would put the Bentley and Rolls on divergent paths, so much so that it would be inevitable that the two car marques would divorce. Bentley was beginning to move away from producing big heavy luxury cars with pillowy soft suspensions, brakes that took a few city blocks to stop, and a slow accelerating torquey V8 engine. The 1980s saw the rise of sporty European touring sedans with sport tuned suspensions, grippy brakes, and quick spirited acceleration. BMW, Mercedes, Jaguar, etc. were all having great sales success with this formula for their luxury sedans. And Bentley wanted in on the action. This was not an easy jump for Bentley but it dove right in, by offering all the finest hand crafted luxury amenities a car buyer could ever want or hope for, while also adding a well tuned sport suspension with great handling, performance car braking, and an engine that could accelerate faster than a runaway train down the side of a mountain. For 1985, Bentley introduced a true performance touring car called the "Turbo R" a car that was finally a worthy successor of the Bentley performance heritage. It may have been a boxy 4-door sedan however it had thick meaty tires, an actual finely tuned touring suspension, and an engine that made the 5,300-lb Bentley really move. 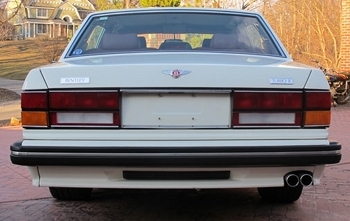 The 4-door Bentley Muslanne Turbo may have been released a few years prior to the Bentley Turbo R, however the latter was the far superior 4-door performance touring car. The Muslanne Turbo used the same motor as the original Turbo R but it lacked the Turbo R’s much better suspension and fatter tires, so it was no surprise the Muslanne Turbo was soon replaced by the Turbo R.
This initial offering of the Turbo R was not without its faults, the main chink in its armor was that it had a carburetor – turbos and carburetors were usually not a good performance mix. The carburetor was just not technologically advanced enough to make use of all the potential power the turbo had to offer. Same was true with the legendary Buick 3.8 liter turbo V6 which really didn’t become a true performance motor until Sequential Fuel Injection (SFI) was introduced. Fortunately Bentley understood this and soon replaced the antiquated Solex carburetor with a modern computer controlled Bosch MK Motronic fuel injection system for 1987. The difference in throttle response was amazing, the Garrett AiResearch turbo and the Bosch fuel injection worked much better together to launch the heavy Bentley like a rocket. Another problem with the rollout of the Turbo R was it took such a long time to reach the shores of the U.S. – 1989 would be the first year the Turbo R was available in the U.S. And it would be no surprise that the first one to reach the U.S. was purchased by none other than Jay Leno. Leno no stranger to rare classic cars and fast cars, was a perfect fit for the Turbo R. After-all the 1989 Turbo R was built the same way the pre-World War II luxury cars were built – by hand like many of cars in Leno’s car collection. Every bolt on the Turbo R was turned by hand and every part installed with absolute precision. Just like the assembly of a Rolex watch, all installed parts are perfect. For instance even if the smallest parts including of a piece of interior trim was found to have a flaw on the production line, it went in the trash bin. This type of craftsmanship was not to be found on the mass produced American luxury cars or even most European luxury cars. So the appeal for someone such as Leno to own such a rare luxury car that also happened to be the ultimate performance 4-door sedan available in 1989, was impossible to resist. Though Bentley officially didn’t release the horsepower and torque ratings of the 1989 Turbo R’s fuel injected 6.75 liter turbo V8, Motor Trend magazine estimated it to be 297 horsepower and 486.8 lb-ft of torque. The Turbo R was good for 0-60 mph run in just 6.7 seconds and a top speed of 137 mph. The top speed was especially earth shattering since the Turbo R was as aerodynamic as a UPS truck and it was saddled with only a 3-speed slushbox (if the Turbo R had an aerodynamic shape and an extra transmission gear, it most certainly would have exceeded 150 mph with ease). However here’s where it gets interesting, you soon realize that if you analyze a 5,300 lb car with a shape like a brick hitting 0-60 mph in 6.7, that Motor Trend’s horsepower rating was underrated. 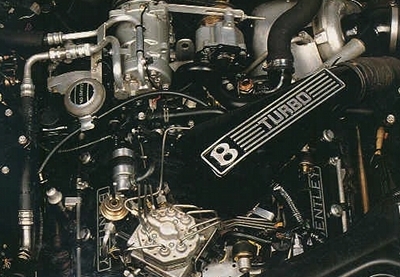 After-all the Turbo R had the same 0-60 mph performance time of a 5.7 liter TPI V8 equipped 1989 Chevrolet Camaro Iroc-Z. The 5.7 liter Iroc-Z for that year produced 240 horsepower and weighed about 2,000 lbs less than the Turbo R. Not to mention the Iroc-Z for its day had a very slippery aerodynamic body shape which helped full throttle acceleration due to less wind resistance. It’s hard to believe that a Bentley weighing 38% more than the Iroc-Z and producing only 20% more horsepower than the Iroc-Z could match the Iroc-Z’s 0-60 mph time. The only explanation was that the Turbo R’s horsepower was indeed over the 300 horsepower mark and torque was probably around 500 lb-ft. If you calculate 38% more horsepower output for the Bentley over the Iroc-Z (to match the 38% more in weight of the Bentley over the Iroc-Z), horsepower was somewhere around 91 horsepower more than the Iroc-Z which would be around 331 horsepower for the Turbo R. Britain’s Motor magazine (now defunct due to being absorbed by Autocar magazine) test drove a Turbo R (June 4, 1988) and listed the horsepower output at 330, however they greatly underrated the big V8’s torque output (by declaring it to be only 443 lb-ft). Motor magazine managed a 0-60 mph time of just 6.3 seconds with their test Turbo R – this was late-1980s Chevrolet Corvette performance territory. 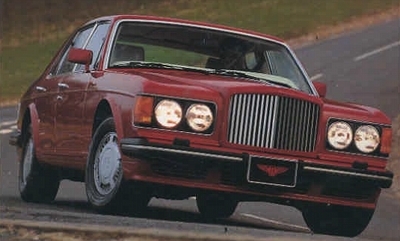 Motor magazine matched up the Turbo R against a 1988 Aston Martin Lagonda which was Britian’s other supercar 4-door luxury touring sedan at the time. The Lagonda may have had the exotic slippery body styling and mystique but the Bentley Turbo R easily made mince meat out of it – beating it in every performance category. Motor magazine summed up the Turbo R’s victory of the Lagonda very well by saying "in conclusion the Bentley Turbo R is the only winner. It was almost no contest, but that is not say that the Bentley merely dismissed an ill-executed and half-hearted contender. The Bentley is a serious driver’s car in this most potent guise. Very little of its comfort image is lost, while it has gained new respect as rapid long-haul transport. The silky-smooth and very responsive turbocharged V8 earns an honest living while the car’s handling poise and sure-footed braking make it pleasurable for serious driving." Motor magazine was indeed correct about the responsive nature of the Turbo R’s turbocharged V8. The power output was linear with no turbo lag – power built up fast and smooth. The engine made the big Bentley feel like a massive Boeing 747 on the runway when all four jet engines go into the full throttle – the thrust pins you to the back of your seat. With one exception of course, the Bentley does this without the loud blast of a jet engine, the Bentley’s V8 is fairly quiet even at full throttle – you can hear that familiar V8 growl however it was muffled. The Turbo R was certainly the automotive version of Teddy Roosevelt, it spoke softly but carried a big stick. The mandatory heavy duty ultra-smooth shifting 3-speed automatic transmission (which was built by GM) worked well with the powerful turbo V8. It shifted smoothly around town in normal driving conditions and under full-throttle acceleration it shifted at all the right points in the rpm range for optimum acceleration. The only downside was the lack of an overdrive gear, which most luxury performance sedans had by the late-1980s. However many of these early 1980s vintage 4-speed automatic overdrive transmissions suffered from early upshifting during city type driving which was good for gas mileage but hindered engine responsiveness. So maybe the Turbo R’s lack of a 4th gear wasn’t such a bad thing. Motor magazine yielded about 15 mpg under normal driving circumstances which was about the best you could hope from from the large displacement powered Bentley. However most owners could have cared less, with the Bentley Turbo R’s base price being $195,000 back in 1989 – and this was back when $195,000 bought a family a very substantial house in most areas of the U.S.
With the Turbo R, Bentley threw out the window the traditional steel wheels with ornate hubcaps and replaced them with a set of sporty 15 inch aluminum wheels with ultra-wide P275/55 VR15 tires. These tires were wider than the tires found on most good handling performance cars back in its day. As a comparison the 1989 Corvette which was America’s best handling sports car at the time also had a tire width of 275 mm. These big sticky tires didn’t mean that the Turbo R was like many one trick ponies back in the day which just slapped on a set of wider tires with shorter sidewalls to improve handling and then give the rest of the suspension a lick and a promise – every component of the Turbo R’s suspension was reworked to provide the best possible handling experience. Everything from the anti-roll bars to suspension dampers was improved. The result was the Turbo R being right there in the middle of great handling territory – you weren’t going to find a 4-door sedan with better handling back in 1989. And this great handling didn’t come at the cost of a harsh ride. 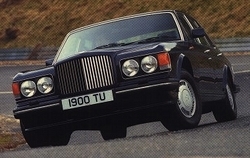 There was no doubt that the Turbo R’s ride was much firmer than previous Bentleys. However it still managed to absorb the rough patches, potholes, and bumps of the worst roads with relative ease keeping those in the passenger cabin happy. Put another way if the Turbo R happened to back in the day find its way into service as a hauler for a Fortune 500 company CEO, this CEO would be perfectly satisfied with the ride quality. Braking for the Turbo R was also phenomenal, when you consider the hefty nature of the car. It’s large four wheel disc brakes made effortless short distance stops a piece of cake. 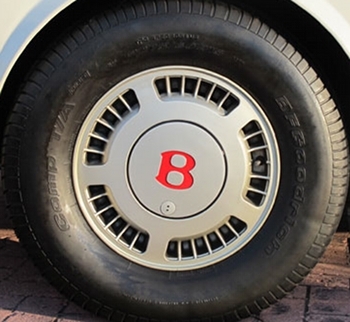 The Turbo R’s big tires with large contact patches also helped with quick stops. One glace at the Turbo R’s interior, even today long after it has ceased production, your jaw will still hang open in shock at how ornate the interior is. 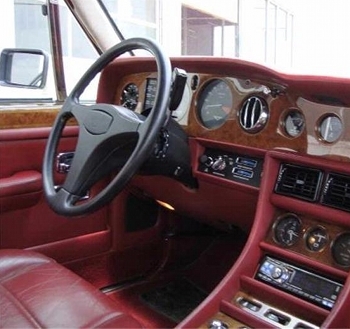 The difference between the Bentley Turbo R’s interior and the best Cadillac offered in 1989 was the difference between Buckingham Palace and a one bedroom flat in a good section of London. Not only is the Bentley’s interior so appealing to the eye, but the carpets, the leather seating, and the burl walnut veneer wood were all made from the finest materials available anywhere in world. And once you get past the interior’s beauty you discover that where the Turbo R really shined was in sheer interior comfort. There was plenty of room for five large adults, and the seats were more comfortable then the finest living room furniture. 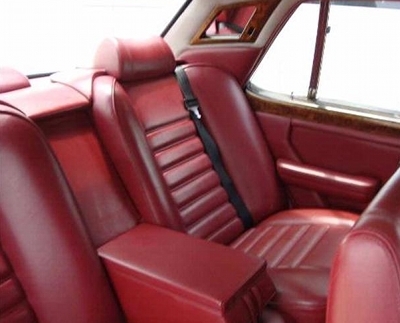 The front seats also had good lateral support in the seats when compared to most luxury touring cars back in the day. The only flaw in the interior was the "old fogey" style automatic transmission shifter lever on the steering column. Like most performance and touring cars of its day the lever belonged in the beautifully crafted center console. The Turbo R was a big success for Bentley, not just in terms of bringing the Bentley back to its performance roots but also in sales. A little less than 6,000 were built over 10 years which for such an expensive speciality performance car was a big accomplishment. After the introduction of the Turbo R, Bentley was never the same. It went from being a status symbol for mostly older rich clients, to a hip driver’s car for the wealthy. Before the Turbo R, most celebrities would have steered clear of the Bentley. Jay Leno was the first of many younger celebrities who would be attracted to the revived performance image of the Bentley. The list of modern Bentley owners include Paris Hilton, Shaquille O’Neal, Kobe Bryant, Kim Kardasian, David Beckham, and many others. The true testament to how fine a car the 1989 Bentley Turbo R is – happens to be the fact that Leno still owns his 1989 Bentley Turbo R which remains in his private collection (and is one of a the very few cars he purchased new to make it into his car collection). And the true testament to how great a performance car the Turbo R is even using today’s standards – Leno who loves modifying many of the cars in his collection has left his Bentley’s turbo V8 unmodified. Leno who has the monetary resources to own any car he wants, however his Bentley Turbo R still remains one of his favorite cars – that is the best testament of all.